The U.S. Patent and Trademark Office issued a patent to ForeverLawn® for the invention of an innovative synthetic grass system for dogs. The K9Grass® Flushing System, covered by patent US 9,670,626, incorporates a unique synthetic turf called K9Grass, combined with a hidden cleaning and drying system that provides an ideal surface for pet use. ForeverLawn, the leading synthetic turf company, announced the U.S. Patent and Trademark Office issuance of a patent for their invention to enhance a superior synthetic grass system for dogs. The K9Grass Flushing System (KFS), covered by patent US 9,670,626, incorporates a unique synthetic turf called K9Grass, and combines it with a hidden cleaning and drying system that provides an ideal surface for dog boarding facilities, pet resorts, dog parks, kennels, veterinary facilities, and more. The invention allows for effective indoor use of K9Grass for dogs, and provides exceptional drainage and cleaning mechanisms for dog environments both indoors and out. K9Grass has several unique features that make it ideal for dog environments. The knitted construction provides instantaneous edge-to-edge drainage at rates of up to 100 times that of typical turf. This is a significant advancement over common tufted artificial grass that can hinder drainage of dog urine and other liquids. The AlphaSan® antimicrobial technology built into the blades contributes to cleanliness and safety. Unlike common synthetic turf, K9Grass does not require infill, which makes cleaning the grass more effective, and prohibits pet waste from being trapped on the surface. K9Grass also offers superior durability against wear and tear. The knitted backing secures the blades more effectively than standard urethane backing, making it resistant to digging and chewing. While K9Grass is routinely installed over an aggregate base, the KFS incorporates a floating grid base, the proprietary ForeverLawn AirGrid 3, to allow proper airflow and drainage under the grass. A perimeter flushing system provides water for rinsing the floor (with an infused cleaning solution option). Similar to flushing a toilet, the KFS dilutes urine and residual waste while moving it to the drain and out of the facility. This system, with the combined use of recommended cleaning equipment, revolutionized the industry by creating a method for using K9Grass over solid surfaces for indoor applications. Patented K9Grass Flushing System DiagramForeverLawn is proud to announce the patent issued for its innovative K9Grass Flushing System. Designed to provide a safe and effective synthetic grass system for dogs, the patented K9Grass Flushing System provides the most superior system available for both indoor and outdoor applications. 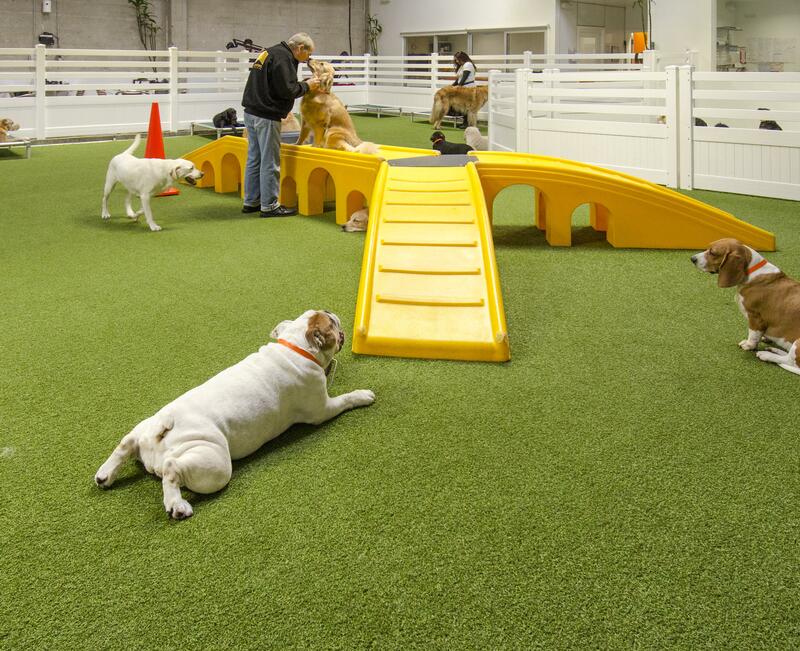 The patented K9Grass flushing system in use at LA Dogworks in Los Angeles, CALA Dogworks in Los Angeles, CA implemented the patented K9Grass Flushing System in their 10,000 square foot state-of-the-art facility for dogs.